Humankind has always tried to enhance their looks. Therefore, jewelery, clothes and other accessories have been present since time incarnate. One of the oldest ways of decorating oneself known to human kind was the tattoo. Here is a brief history of the tattoo. Tattoos have been used for all kind of purposes ever since the dawn of time. Over the years, they have served as symbols of rights, symbols of rank and seniority or being juniors, symbols of spirituality, devotion, religion, rewards and awards for bravery, amulets, talismans and security. 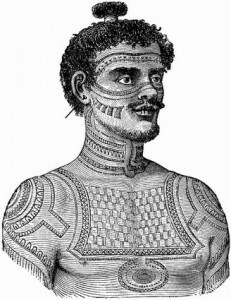 Tattoos were also used as a symbol of punishments, being outcast, slavery and conviction. Tattoos have been one of the most frequently used body arts. The word tattoo is derived from the Polynesian word, ‘tatao’, which literally means to tap or to mark someone. The word was coined by Captain James Cook in 1769. The original way of creating tattoos was definitely much more brutal than it is today. A sharp pointed comb would be dipped into lampblack and then moved around on the body. The fad then spread from the Polynesian and Tahitians to the Europeans. Proof of tattoos being used as long as five thousand years ago has now been uncovered. Modern archeology has found proof of tattoos being used in the Egypt, Roman, Greek and Japanese regions. Greeks normally used the tattoos to indicate slavery. The Mayas, Incans and the Aztecs are known to use tattoos. Tattoos were sometimes also used as a mark or symbol of belonging to a tribal group or tribe. Tattoos have had other uses in different regions. Tattoos in Egypt can be found as early as before the Pyramids were made. The Greeks used the tattoos primarily to transmit messages between their spies. The Asian world used tattoos to denote a woman coming of age or her marriage. Japan used tattoos for religious purposes and other ceremonial purposes. Tattoos were also used to induce the sexuality in a person. The tattoos of Japan were prepared by the women of Borneo. The women of Borneo were the first to use tattoos to denote the status and place in life of the owner of the tattoo.